Ibis Bradford Shipley01274 589333work01274 589444fax HotelModern 78 bedroom hotel situated close to Bradford and Leeds on the banks of the Leeds Liverpool Canal. Conference facilities for up to 30 people. 24hour snacks and bar. Restaurant open 18.00 - 22.00, 365 days a year. 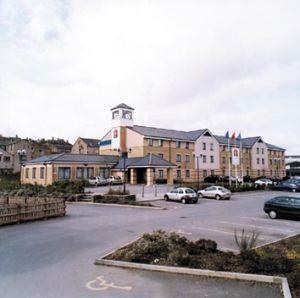 Located close to Saltaire, UNESCO World Heritage Site, the hotel is great for business and leisure. Dogs welcome at £5 per dog. Children welcome from any age. Follow signs for Salts Mill. Turn right out of station, walk down through lights, hotel on left.